Shirts With Random Triangles: Four-Star OT JP Urquidez Says He "Will Not Be Enrolling At Baylor University." 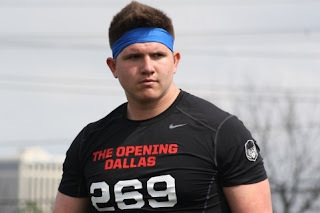 Four-Star OT JP Urquidez Says He "Will Not Be Enrolling At Baylor University." JP Urquidez. Image via Bleacher Report. Baylor is already beginning to feel the fallout over the scandal that resulted in the firing of former head coach Art Briles. Offensive tackle JP Urquidez announced via Twitter that he had decided not to enroll at the school. I will not be Enrolling at Baylor University tomorrow morning... Thank you Baylor Nation for the continuous support! No reason was given, but you can probably read figure out why Urquidez decommitted. 247Sports graded Urquidez as a composite four-star offensive tackle prospect. The recruiting site ranked Urquidez at no. 21 among OT prospects for 2016, at no. 37 among 2016 prospects from the state of Texas, and at no. 243 in its national composite rankings. Urquidez attended Copperas Cove High School in Copperas Cove, Tx. He stands 6'5.5, and weighs 300 lbs.